"Students love to click to their sources, rather than going through hard-bound newspaper issues in the stacks." An environmental scan of North American Catholic newspapers to determine what newspapers exist, where they are located and the extent of holdings and formats. A summer 2012 pilot project at the University of Notre Dame resulted in the identification of 800+ titles. Creation of a comprehensive directory of North American Catholic newspapers, freely available to all, via the International Coalition on Newspapers (ICON) database; CRRA works with member institutions and partners to contribute title and holdings data to ICON. Collaborative digitization of priority papers with the help of our Digitizing Partners. Initial efforts are focused here while simultaneously providing encouragement, guidance, and support to others interested in digitizing Catholic papers. Implementation of a shared repository for Catholic newspapers, including the priority papers and beyond. The repository will contain already-digitized and born-digital content. The Catholic News Archive is freely available now! Last but not least, please see the current listing of Catholic Newspapers Online - and help us to populate this list by sending us information about digitized or born-digital Catholic newspapers. For those interested in historic newspapers more generally, please also see Kenneth Marks's website, which currently has over 15,000 links to free online historic newspapers in the US and Canada. We are a non-profit, collaborative organization and as such, welcome and encourage your participation to achieve our goals. More on how you can help. A Fully-searchable open digital repository of historical Catholic news, a flier distributed at the American Catholic Historical Association Annual Meeting, Chicago, Jan. 3-5, 2019. Catholic News at your Fingertips, by Jennifer Younger. ATLA Newsletter, August 15, 2018. Digitized Catholic Advocate Provides a Window to Newark's Past During Vatican II, by Michael Giorgio. Seton Hall University News. July 21, 2018. Catholic News Yesterday, Today and Tomorrow, by Jennifer Younger. ACCU Update Newsletter, Summer 2018, pp.14-15. Digitization Project Preserving Century of Catholic Newspapers and Newsfeeds, by Katherine Nuss, MLS. The Archival Spirit, p. 2, July 2017. Introducing the Catholic News Archive: Flyer for the 2017 Catholic Media Conference. Québec City, Québec, Canada. June 20-23, 2017. 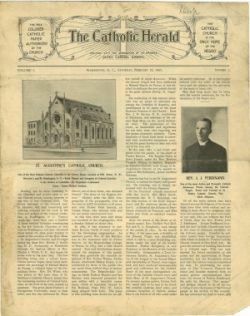 Digitization Project Preserving Century of Catholic Newspapers, Newsfeeds, by Mark Pattison. Catholic News Service, February 1, 2017. Best Practices for Digital Archiving: Aggregated, Catholic, Collaborative, presented by Pat Lawton and Jennifer Younger. Catholic Media Conference, June 3, 2016. Building a Catholic News Archive, presented by Pat Lawton and Jennifer Younger. Catholic Media Conference, June 25, 2015. Implementing the Catholic Newspapers Program: Collaborative Digitization and Discovery within a Nonprofit: Distributed, Online Organization, by Patricia Lawton and Alexandra Budz. IFLA 2014, Newspapers Section Pre-conference, Geneva, Switzerland, August 2014. The Catholic Research Resources Alliance: Providing Access to Rare and Unique Materials, from the Spring 2013 issue of American Catholic Studies Newsletter.